This mechanical arm was the first prototype used on the robot Cog. The arm has six degrees-of-freedom to roughly approximate human ranges of motion. Each of the joints incorporates a series elastic actuator, and is force controlled. This arm has been replaced by a pair of arms of similar design. Cog's hardware is constantly evolving. This design was the second to be used on Cog. This head has been replaced by a design that more closely matches human ranges of motion. 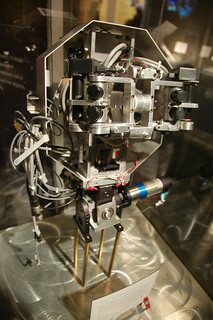 Cog was a project at the Humanoid Robotics Group of the Massachusetts Institute of Technology. It was based on the hypothesis that human-level intelligence requires gaining experience from interacting with humans, like human infants do. This in turn requires many interactions with humans over a long period of time. Because Cog's behavior responds to what humans would consider appropriate and socially salient environmental stimuli, the robot is expected to act more human. This behavior also provides the robot with a better context for deciphering and imitating human behavior. This is intended to allow the robot to learn socially, as humans do. As of 2003, all development of the project has ceased. • To study theories of cognitive science and artificial intelligence (AI). • To design and fabricate a humanoid face for each robot that fosters suitable social contact between robots and humans. • To create a robot which is capable of interacting with humans and objects in a human-like way. • To develop a relatively general system by which Cog can learn causal relations between commands to its motors and input from its sensors (primarily vision and mechanical proprioception). • To shift the robot aesthetic to a design language that utilizes strong curvilinear and organic forms through state of the art design processes and materials. • Development of a human-like face for Cog (complete). • Obtaining major degrees of motor freedom in trunk (complete), head (complete), arms (complete), legs, and a flexible spine. • Sight (through video cameras that respond to movement; complete). • Hearing, touch, vocalization system, and hands. • Allowing Cog to learn how its own movements alter its sensory inputs. • Forcing Cog to take energy efficiency into account during movements. One motivation for making humanoid robots can be understood in the book Philosophy in the Flesh by Mark Johnson and George Lakoff. They argue that the contents of human thoughts are to some degree dependent on the physical structure of our brains. By constructing artificial intelligence systems that have structural features similar to those of humans, we may be more likely to achieve human-like functionality. Another motivation for building humanoid robotic systems is that a machine with a human-like form may have more human-like interactions with people. This could be particularly important for an artificial intelligence device to learn from people in the way that human children learn through interactions within a social group. Cog appeared in the Understanding television series episode "The Senses".